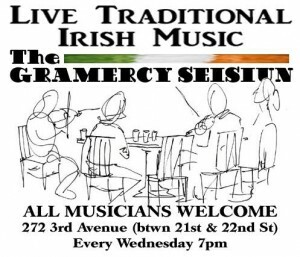 The Gramercy House, an Irish pub in the location formerly The Copper Door, presents the Gramercy House Seisiun, one of NYC’s newest Irish traditional seisiuns. It kicked off on Wednesday, July 16, 2014 and continues every Wednesday at 7pm. Open to ALL musicians/singers and/or folks who may just want to listen, they plan to feature some of NY’s best trad Irish musicians. Opening night featured John Walsh (guitar), Andrew McCarrick (flute) and Denny McCarthy (fiddle) of Jameson’s Revenge. To keep up to date on upcoming seisiuns, join the Gramecy Seisiun group on facebook.